My pal Steve works four days a week and looks forward to getting outside on his Fridays off, his preferred form of recreation involving a modest hike in the local hills accompanied by a picnic lunch on which we eat cheese, fruit and other snacks while consuming a bit of wine. He had started this ritual with another pal, Tom, and they had settled on a bottle of wine to share between the two. When they began inviting me, it was required to recalibrate the appropriate amount of wine for three to share. Clearly, a single bottle wasn't enough. We started with two bottles and after a few weeks began to wonder if that was really enough. After all, Tom is irish and the irish really have no limits, we were told. So the next week Steve brought three bottles, and unbeknownst to the others I had a fourth stashed away in my backpack. Long story short, all four bottles were consumed, and as is customary, all before enjoying the picnic lunch (to maximize the effect, the irishman instructed). This had the result of sending Steve and I to the ground, myself puking my portion of the picnic lunch in the process, and more than an hour of dizzying nausea that kept me from getting up from the dirt I lay in. Tom, having consumed as much or more than Steve and I, calmly stood over us, shading the blazing sun from my face, while texting, sending emails and otherwise behaving as any irishman would who'd had a bit of the vine and found himself disappointed with his weak companions. Turns out two bottles was the right number. 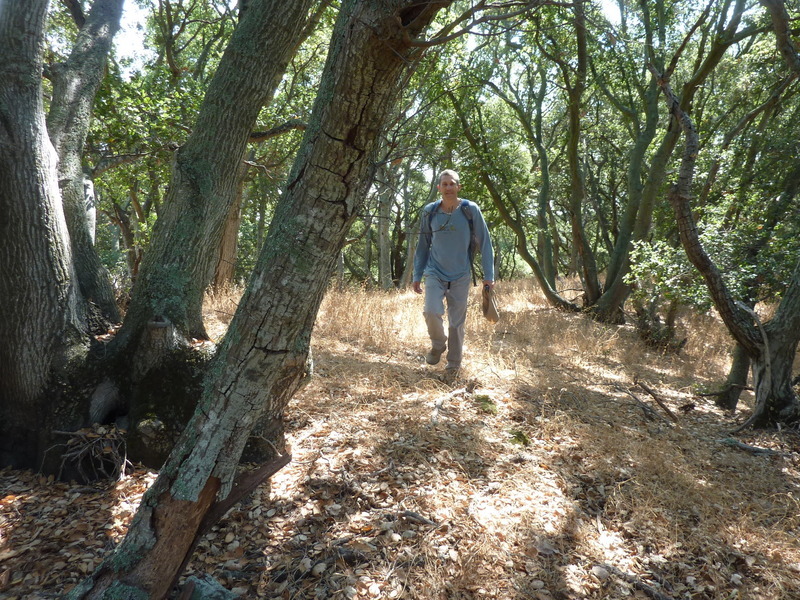 Today we headed to Almaden-Quicksilver park in South San Jose to tag a most minor summit, Jacques Ridge. ListsOfJohn had sometime in the past year or so added features with names ending in "Ridge" to its database. Many of these are of exceedingly low prominence and not worth the effort, but I had dutifully copied them all to my own database and now had more places to visit close to home. From the trailhead off Hicks Road, Jacques Ridge highpoint is a mere half mile away. We had hardly started our hike when I announced I needed to "wander off into the brush, looks like there's some poison oak here." Tom smartly declined to join the off-trail bit, Steve coming along when he concluded the poison oak didn't look abundant. We found the top amidst a clump of oak trees holding the earth together here, no views at all. Steve thought the shady summit area might make for a nice picnic spot but I suggested we could probably do a lot better.